When I work with clients, one phrase I hear over and over is, “I am afraid.” And when I ask where the fear comes from, I get all kinds of answers; most of which almost always boil down to a few common threads. Rejection. Disappointment. Loss. I’ve had my share of fear, so I can empathize with clients. I also know what it’s like to be on the other side of fear — how freeing it feels to release it; how empowering it feels to move forward. And because I know the power in that courageous transformation, I am dedicated to helping others move through fear, so they can experience the other side of a frightening emotion — the other side of fear. What I’ve learned is that when we choose to confront that which we are most afraid of, something magnificent occurs. Doors open. People step into our lives. Information opens our hearts and makes us braver. The universe conspires to support our effort. In January of 2014 I made a decision to write a self-empowerment series to share the many important lessons I’d learned as a life coach. I realized that too many people struggled with the same life challenges. By writing and publishing #coaching insights, I knew I could help more people. Just a few months later, I was invited to join a Facebook group of visionary female authors. This group of women have all been brought together by super-visionary Linda Joy, whose message is to give freely and not worry about receiving. From a heart-centered space of giving, the act itself is enough to ensure we get what we need, when we need it. I saw this as a sign that I was moving in the right direction. Belonging to a group of women who are more focused on giving of themselves means that we all get incredible amounts of support. These women have helped spread my “living joyfully” message amongst their own readers. I’ve even had the honor of interviewing several of them who shared personal stories of overcoming fear. Their stories are being intricately woven into my forthcoming book about conquering fear once and for all. With personal stories revealing vulnerability and doubt from women and men, readers will gain inspiration and courage to embrace doubts and fears holding them back from living life to the fullest. Join my mailing list (top right) and you may be selected to beta read the book prior to it’s publication. I count on readers like you to give me critical feedback to ensure my writing provides readers the greatest benefit possible. By joining my mailing list you get two bonuses right away! First of all, you’ll receive my latest eBook Five Roadblocks to Living Your Dream & How to Bulldoze them Out of Your Life! Secondly, your name will automatically go into a quarterly drawing I have for a $25 Kindle gift card! Join the Power of Living Joyfully Facebook community where I share inspiring content to keep your spirits high and your sights focused on the living the life of your dreams! 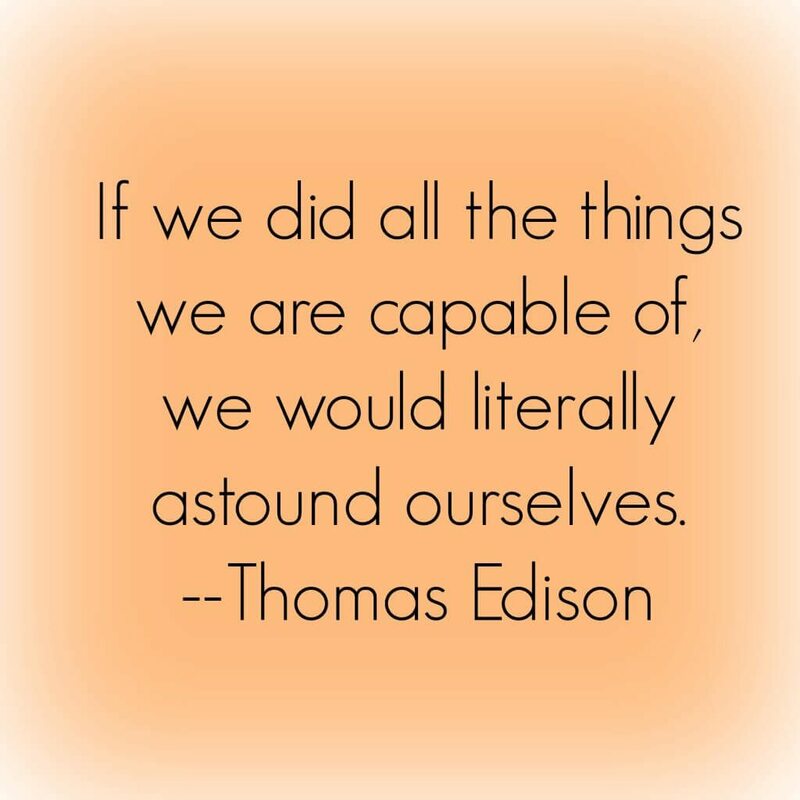 So, back to that quote at the top of the page by Thomas Edison… What can you do to astound yourself? I’d love for you to share in the comments below. Sheila Callaham is the author of seven books and a success coach who has coached and mentored hundreds of clients to a happier life. If you want more information about Sheila’s coaching programs, please click the coaching tabs at the top of the page.